Welcome to KERA! Where are you located? Got any Pics? You need lots of pics with close detail. Also need a much more detailed description of any defects. How many owners n stuff. Come over to zl-oa site, you can become a member, we have a active gallery there. Here is the link, look forward to seeing you there! This is the spot to post up your queries for Dale....Now let's keep in mind that he is doing us a favor by being here, and not all pile on at once...Let's post up a few and see where that takes us, as he will not be on every day. Thanks Dale for your time!!! Glad to see you made it in here. I'm really exited to have you here. Let's get this thread rolling! I wanted to talk about slide drilling. I don't know if your kit requires this and what are the advantages? as the ZL motor appears to be prone to heat issues - would fitting an OIL COOLER be a good solution ? I know Dale recommends Engine Ice , but would appreciate his thoughts on this. Maybe ANTI-WHEELIE BARS or GOD would better suit his ranking ! No i dont drill the slides in my kits ,The slide springs and original needle taper is actually very good in the ZL carbs, with the right jetting along with shimming the needles properly they work fine without drilling. The bikes are so low gear they snap right to life anyway and i dont like to drill anything internally if i dont have to. With more air flow, my + 4 advancer and a good A/F ratio they come alive pretty well. Also very smooth through the rpm range. The ZL was much better than the first couple years of the 900 Ninja. I would say run a good synthetic oil, a 9 heat range spark plug with the engine ice and that should be fine. Being that the motor is open and the radiator is a pretty good size there ok. With engine ice added , if the fan still kicks on a lot Id maybe add a switch to turn it on a bit sooner. But try the above first. They are also very lean from the factory so one my jetting kit helps get the heat out of the cylinder head as well. As far as oil, i dont want to start a oil thread, because they can go on until the end of time......ha ha . I run and really like Synthetic Rotella T 5w-40 sold at Wallmart , for about $4.40 per qt. Ok guys got to do my 100 e mails now so take care and i will check back in a few days. Quick one for you Dale. I'm looking at getting pods and dynojetting my carbs, as I've had to get a new exhaust system. Is it necessary to put an advancer in the bike as well, like the one you sell for it? Or is the advancer another optional add-on? Well cant have that cake unless you do some work really. 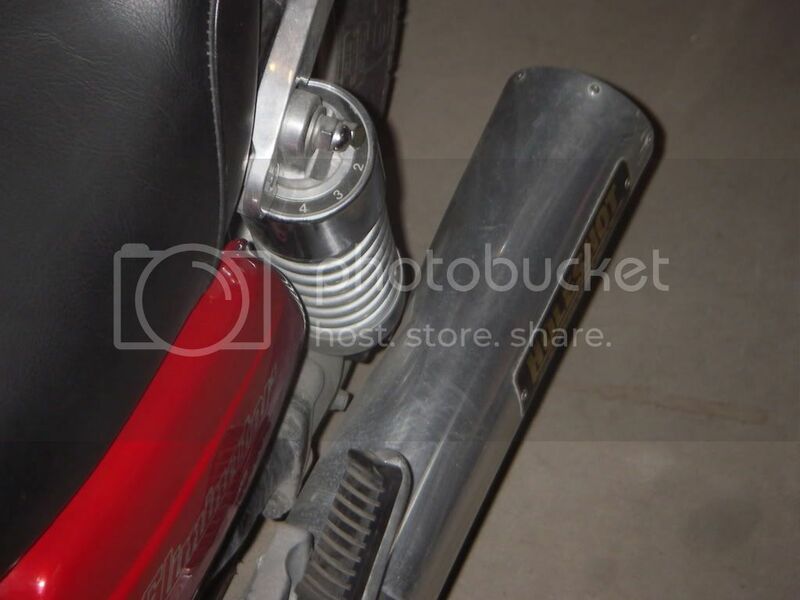 The stock mufflers as well as air filter and air box are pretty restrictive. Id at least go with my stage 1 jetting kit even if you want to keep the original mufflers on it. There is a few hp in the air flow and proper tune up for sure. Keep in mind my stage 1 kit also comes with my timing advancer and those motors like that. If you have yet to buy the kit, you should consider my stage 2 kit instead. Its simpler to set up comes with the pods, crank vent filter and my advancer is included. I can also help you fine tune it after you install it which means a lot these days. Now then if you have already purchaced the other kit, yes i would buy my advancer and install it also. It really helps the throttle response. The other thing i forgot to mention to Lowlife also is the Dyna coils and wires, that wakes them up also. The originals are marginal even new and now are getting very old. A couple of questions for Dale - if he doesn't mind. 1) How much time does the electric shifter save on a run at the strip? 2) I have read - elsewhere, that having a bit of polishing done in the cylinder head can help tp reduse heat there. Is that true? Hi there Dale, had a quick question for you. Took off the exhaust in the process of getting to the top end of the engine and was wondering while I have them off, can I get the dent on the left exhaust pipe pulled somehow? or is there a better suggestion? I would really like to keep them as they sounded great.It might be hard to see the dent, but is right up against the shock tower as that is what caused the dent in the first place. I would appreciate any input you might have, and I can and will be posting more pics once I get back to my shop on the weekend. Thanks a lot.